The VIEROL Academy serves as the training and presentation centre of VIEROL AG. With a surface of 370 m², the center was opened in June 2018 and is located on the site of the logistics center at the Oldenburg-Nord motorway junction. 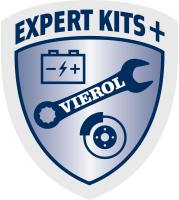 In the VIEROL Academy we develop innovative workshop-focused repair solutions, which we offer in the Expert Kits+ section. They allow you to save time in the identification and procurement of spare parts. Expert Kits + solutions include all the necessary components for a professional, timely repair. We are constantly expanding our product range with new product groups and taking new technologies in digitized vehicles into account. The VIEROL Academy serves as a training and presentation center for both our customers and our employees. Modern media technology enables the transmission of our training courses and presentations via live stream directly to our customers. With the production of installation and tips videos, we stand at your side as a competent partner. What are the benefits of advising the customer on the vehicle? How do I optimize my vehicle acceptance? What potential is there for me in terms of sales and customer satisfaction? What information do I need when accepting an accident? What may I convey and what may I not? How can I avoid lost sales? What does a declaration of assignment mean?